Place potatoes in a large pan, cover with water and cook covered for 10 minutes. Add cabbage and cook for a further 10 minutes until the vegetables are tender. 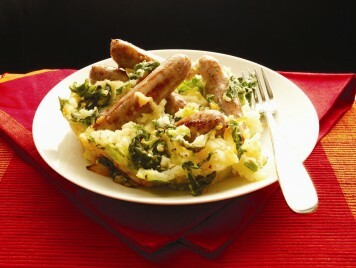 In a large non-stick frying pan dry fry sausages with onion until browned and cooked through, about 15 minutes. Stir in tomato ketchup and Worcestershire sauce. Drain the potatoes and cabbage thoroughly and mash with a potato masher.